U.S. Trade Representative Robert Lighthizer, right, says negotiators and politicians will meet May 7 and try to get a deal. WASHINGTON — The United States says it hopes to conclude a NAFTA agreement this month, otherwise negotiations risk being punted off to 2019 and into an uncertain political climate. U.S. trade czar Robert Lighthizer laid out his preferred timetable Tuesday: He noted that he's scheduled to head to China this week, then holds NAFTA meetings with his Canadian and Mexican counterparts May 7, and said he wants a deal within a fortnight thereafter. "I'd like to get it done in a week or two after that. If not, then you start having a problem," Lighthizer said in a lunchtime discussion at the U.S. Chamber of Commerce in Washington. "I believe if we don't get it done in the next week or two then we're on thin ice about whether it gets done before our [November legislative midterm] election." Basic calendar math shows that it will soon be impossible for any NAFTA bill to meet all the procedural requirements for a vote in the U.S. Congress this year. Then, by next year there will be new members of Congress, and perhaps even a new party in charge, with polls showing a tight race for the U.S. House of Representatives. Lighthizer said a changed legislature could send negotiators back to the table: "The new Congress will have its own priorities…There's just a sense they'll try to open it up again. I may be wrong." Each of the three countries has its reasons for wanting a deal quickly. The U.S. administration not only fears losing control of Congress to the Democrats, but is also juggling multiple trade files at once and some officials would like to put NAFTA to rest. Mexico's government wants to lock in a deal before its July election, with polls showing an anti-establishment, previously-NAFTA-skeptical candidate trouncing the governing party. In Canada, lingering trade uncertainty is hurting business confidence. The latest Bank of Canada report suggests NAFTA and other trade-related concerns will reduce business investment by about two per cent this year, roughly equivalent to 0.2 per cent of GDP. But one trade insider says there will be no deal unless the U.S. downsizes its priorities. Eric Miller notes that the countries have spent months haggling over the minutiae of auto-parts rules of origin, and the idea that they could begin tackling dairy, pharmaceuticals, intellectual property, procurement and dispute resolution, and complete it all within days, is a fantasy. Just last week the countries were still arguing about the basic architecture of the agreement — sources say things got heated, as the U.S. kept pushing for a so-called sunset clause that would terminate NAFTA after five years unless all countries explicitly renew it. "The U.S. government does not seem to have a vision of the endgame it would like to pursue," said Miller, of the Washington-based Rideau Potomac Strategy Group. "One cannot have (a) comprehensive and quick (agreement) at the same time. And until the U.S. reconciles itself to choosing one pathway or the other, we're going to be stuck circling the airport rather than coming in to land." Steel and aluminum tariffs have added an additional challenge. The Americans insist there will be tariffs on all their major trading partners by June 1, unless countries agree to some sort of quota limiting exports to the U.S.; and they insist that, for Canada and Mexico, the tariff negotiations are part of the NAFTA talks. Canada not only rejects the idea of quotas — it rejects the premise that this even belongs in the NAFTA discussion. 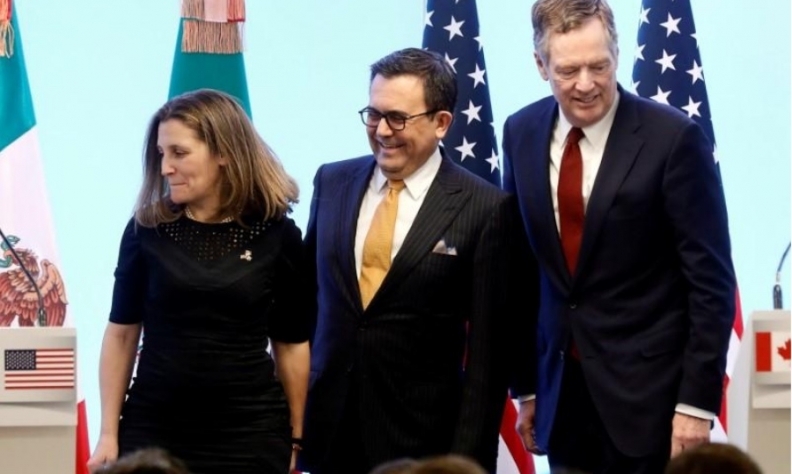 "The NAFTA negotiations are completely separate and are on entirely different tracks," Foreign Affairs Minister Chrystia Freeland said in Ottawa. "Our work continues and will continue until the threat of tariffs or quotas is fully and permanently lifted." Miller credits the Canadian government with getting ahead of the issue last week by beefing up its procedures to monitor so-called trans-shipments of Asian steel through Canada. But he suspects the U.S. will insist upon some sort of agreement within NAFTA, or as an addendum to NAFTA, that controls the transfer of dumped Chinese metals through Canada and Mexico into the U.S.
On Tuesday, the administration underscored that point. Lighthizer specifically stated that the tariffs go hand in hand with the NAFTA discussion, and his administration colleague Peter Navarro cast the choice for countries as an either-or dilemma: tariffs or quotas. "Whatever happens on steel will be directly interrelated to what happens on NAFTA," Miller predicted.